Show your badge and receive $5 off a one-day, standard, full- price admission ticket for up to 4 guests for either SEA LIFE Grapevine -OR- LEGOLAND Discovery Center. Cannot be combined with any other offer. Not valid with pre-paid online tickets. 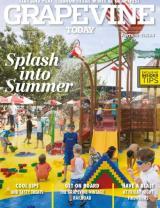 Only valid at LEGOLAND Discovery Center Dallas/Fort Worth or SEA LIFE Aquarium Grapevine. Codes 6482, 6511. Dive in and be wowed by the many beautiful and fascinating creatures of the deep sea as you journey through the amazing underwater world. This attraction is located on the Grapevine Visitors Shuttle Route, stop F. Admission Hours: Mon-Fri: 10 am to 6:30 pm Sat: 10 am to 7:30 pm Sun: 11 am to 5:30 pm *Attraction closes 1.5 hours after last admission.